An orthorectified photograph (orthophoto) can be used to measure true distances, because it is an accurate representation of the earth's surface. First Base Solutions (FBS) specializes in mapping and Geographic Information Systems (GIS) and since its inception in 2000, FBS has become one of Canada's leading providers of high-resolution aerial and orthophotography mapping. These high-quality air photos and orthophotos are what have made us a reliable source of geospatial data for engineers, urban planners, utilities and service providers, along with many other professions dependent on map-accurate, photo-realistic data. Our orthophoto maps are divided into tiles and available for online order and download in compressed MrSID, ECW, and JPG formats which are compatible with ArcGIS, AutoCAD, and most standard GIS and image processing packages. Orthorectified imagery for the principal metropolitan areas in Canada and many smaller urban communities in Southern Ontario are readily available in MapWarehouse and are continually updated to build upon our already extensive database. MapWarehouse offers up to 10cm resolution orthorectified imagery for immediate online order and download. 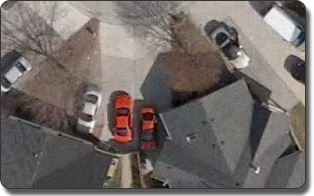 This means our aerial camera has captured details as small as 10 centimetres on the earth below, such as roof shingles, lines in parking lots, and cracks in the pavement. Above is a comparison of 60cm resolution (similar to what can be captured with satellite imagery) to 10cm resolution orthophoto. Please note: Images have been zoomed out to show a larger coverage area for comparison purposes. The zoomed in detail of the 10cm resolution is even more extreme when examined up-close. Imagery stored in our online product warehouse is available for direct purchase and download, 24 hours a day, 7 days a week. Visit our map page to view our list of current orthophoto maps and imagery. For assistance with general inquiries and custom order requests, contact our Customer Service Representatives at info@firstbasesolutions.com. For a complete list of our orthophoto and aerial imagery coverage areas, please visit our interactive coverage map. FBS recognizes the need for air photos with higher resolution, better accuracy, and improved image quality. Satellite imagery can only provide up to 60 cm resolution and are often restricted by atmospheric conditions that obscure the ground, such as adverse snow, fog, cloud, smoke and haze. Satellites are limited to a sun-synchronous orbit making them difficult to reposition for specific projects within tight time lines. Our high resolution aerial imagery is aircraft-based and offers much greater flexibility compared to satellite aerial photos. In addition, the othophotos derived from our imagery can provide resolutions of 30cm up to 3cm and display minute details, such as cracks in the pavement or the grates in a catch basin. Please visit our samples page to view different resolution samples and download file format samples. Our orthorectified imagery, known as orthophotos, are georeferenced using mathematical models of photogrammetry for the removal of tilt, terrain, atmospheric, and other digital image distortions and are seamlessly joined together, regenerated and enhanced in terms of colour and contrast, giving the user the positional accuracy of a map, plus the detailed visual information inherent in a photograph, thus creating an aerial photo map. To acquire digital aerial photos, FBS uses a pressurized Cessna 414 aircraft equipped with an 86Mp Vexcel UltraCAM-D digital aerial camera, Somag 3000 gyroscopic mount, Applanix POSTrack AV-V5, GPS, IMU and Track-Air navigation system as well as the very latest in aircraft avionics. The raw photos are processed at our office using a combination of proprietary technologies that create a semi-automated process, allowing for very quick turn-around and delivery of orthophotos, on time and on budget.